It's important to reexamine old ideas from time to time; you never know what new insights may be revealed. The articles in this issue highlight changing attitudes around some long-held beliefs. 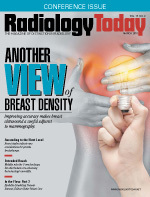 To begin with, our cover feature describes different ways of screening women who have dense breast tissue, which is a growing focus of the breast imaging community. To get the word out about breast density, 31 states now have some form of notification requirement, and several others have reporting and education efforts that do not require notification. Although dense breast tissue is considered normal, several studies have found that women with dense breasts have a higher risk for breast cancer. In addition, dense breast tissue makes it harder to spot lesions on mammograms; this is why adjunct imaging is sometimes recommended. There are questions, however, about what the most effective adjunct imaging may be. Digital breast tomosynthesis has gained traction in recent years, but it is by no means universally accepted as the most useful way to screen women with dense breasts. Ultrasound, an older modality, has its proponents, but handheld ultrasound is time consuming and operator dependent, and many believe that it's not practical for mass screening. And mass screening is an issue, since up to one-half of all women in the United States aged 40 to 74 have dense breast tissue. Kathy Hardy takes a look at newer ways of performing breast ultrasound—and interpreting it—that may change the way breast imagers think about adjunct screening. Hardy spoke with several experts who discuss the new methods and what they think ultrasound's role will be. In research news, Dan Harvey reports on results from the ASCENDE trial, which examined the use of brachytherapy with radiation therapy for prostate cancer treatment. Once a common prostate treatment, brachytherapy has fallen out of favor in recent years due to a higher rate of side effects and the perception that intensity modulated radiation therapy was sufficient for treatment. The study results call that perception into question, and low-dose brachytherapy seeds may prove to be a useful addition to prostate cancer treatment. Also in this issue, Keith Loria reports on the latest trends in C-arms. New features are enhancing the modality's versatility. Finally, in Part 2 of our look at workflow, Beth W. Orenstein examines how scheduling affects radiologists' work satisfaction and patient care. New ideas about scheduling are changing the way radiology departments manage workloads.